Welcome to August, did everyone have a good July? This past month, we spent a lot of time meeting with friends and family. It has been very nice catching up and bonding over great food. When eating out, we prefer to go to fast-casual restaurants where tipping is not customary. When ordering alcohol at a restaurant, we limit it to less than 2 drinks - anymore is just a fantastic waste of money. It’s one thing to pay for food that someone else has prepared for you - it’s a waste to pay to have someone pour you a drink right out of a bottle. Since we eat out so infrequently, going to any sit down restaurant is a rare luxury to be savored. I know plenty of people who eat out for one or two meals a day. For them, there’s nothing special about eating out - it’s just a routine part of the day. We’ve also had people over to our house for home cooked meals. It is so comfortable and relaxing gathering together at home. The food is healthier and there are fewer expenses as well. Clean up is a breeze – just pop the dishes into the dishwasher. Eating at home also saves time finding parking, waiting for waiters to come take your order and waiting for the bill to arrive. Since our son turned 2, there have been some huge changes. 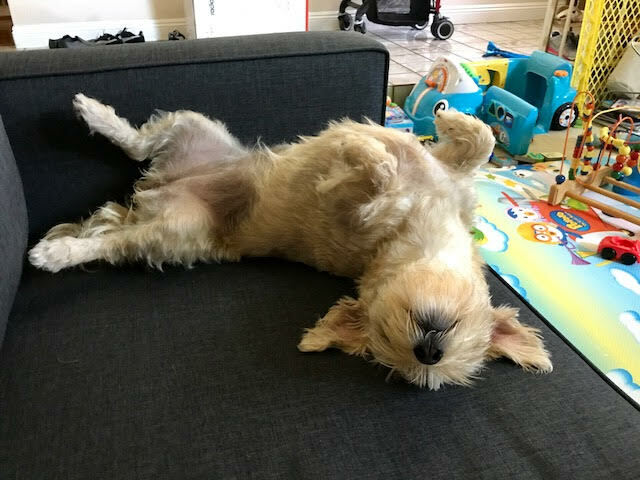 Physically, he is less clumsy and more sure-footed. 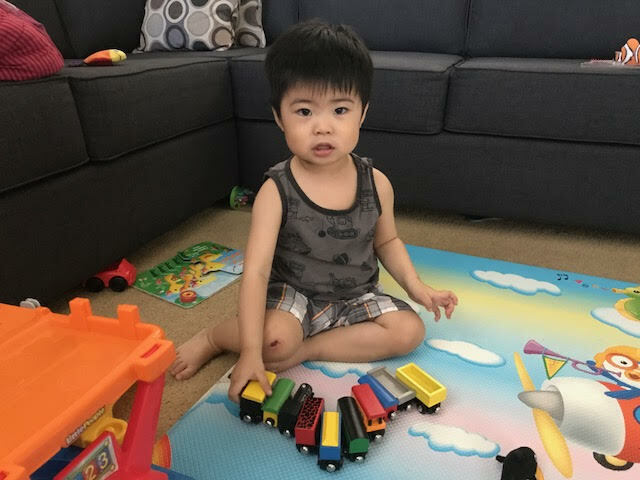 Developmentally, he is starting to learn many new words, talking more and putting together short sentences. We are proud to share that he knows his entire alphabet, can count from 1 to 20, knows all his primary colors, and much more. The biggest challenge we now have is managing our son’s terrible twos. His new favorite word is “NO” and he gets frustrated extremely easily. Here's a picture of our son playing with his train set. Our son has already had several temper tantrums. This happens when he gets frustrated that he can’t accomplish a certain task he wants to do on his own (like stacking blocks). If he fails at stacking blocks a few times, he will end up screaming and throwing all the blocks around. There are other times where our son wants to tell us something, yet does not have the language development to properly communicate. He will get so flustered that he will scream and cry. Any parents who have a toddler will know what it’s like dealing with these tantrums and meltdowns. Things have gotten especially crazy (and embarrassing) when our son decides to throw a tantrum in public. We are trying to balance out giving our child some independence and keeping him structured at the same time. 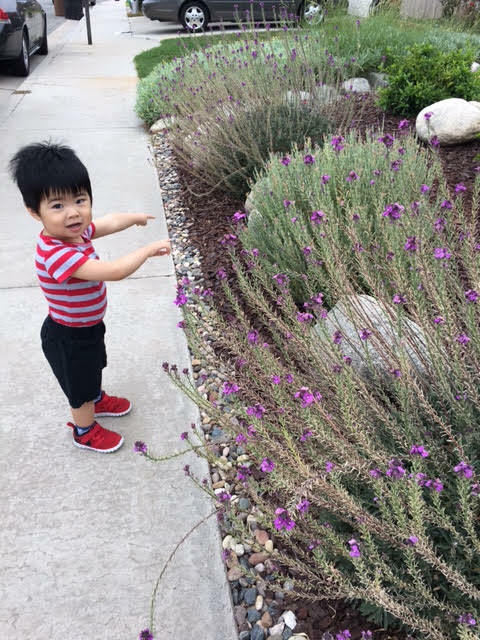 Our son loves going on long walks and exploring the different plants and flowers in our neighborhood. Being in nature really calms him down. 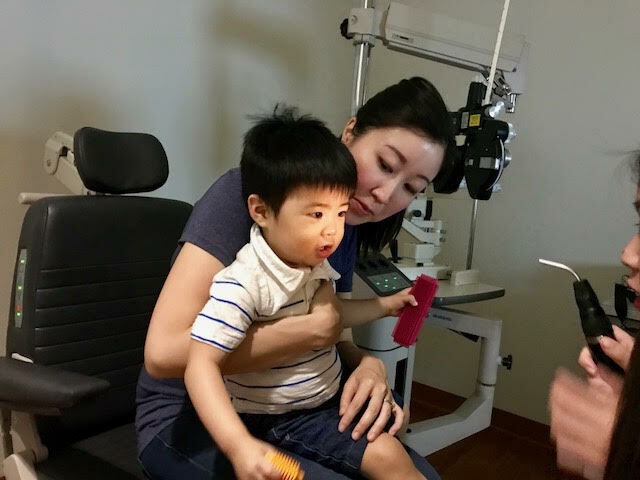 This month we took our son in for his second eye examination. It didn’t go so well as there was plenty of hitting, kicking and screaming. The good news is that his optometrist was able to determine that he doesn’t need glasses and that his eyes are healthy. Our son's vision is 20/20! We also took our son in for his first dental appointment and are happy to share that he has no cavities! Whew. And here is a random picture of Abby being lazy. On 7.4, I received a $1.50 deposit into my Discover Cashback Checking account. I keep this online checking account open since you can earn 10 cents (up to 100 transactions per month) on debit card purchases, bills paid through Discover’s online bill pay service, or checks cleared. On 7.10, I received a check for $162.50 for teaching at the local university. On 7.7, we received a net profit of $465 from our rental property. Our tenants had some issues getting rent paid on time and so they paid $35 in late fees. While this is extra money for us, I’d rather have our tenants continue to pay rent on time. On 7.31, I received $750 in referral bonus income for referring a new colleague to our medical group. I have already referred 2 colleagues to join our practice. This is why networking and keeping connections is so important. In many industries, businesses look first towards internal referrals prior to putting out advertisements. While knowing the right people doesn’t guarantee you will get a job, it can get you access to the front of the line. All of this totals $1,379 from our side hustles for the month of July. With our second baby due in December, we have been continuing to save up. Side hustle income is the cherry on top.